When people think of spring, it is likely that images of warm weather, new beginnings and more sunlight come to mind. One thing that stands out for many is the flora that comes into bloom and is at its peak during this season. However, even with ideal weather and growing conditions, it is important to be proactive and have a plan ready well in advance to ensure you are successful with your spring landscaping. 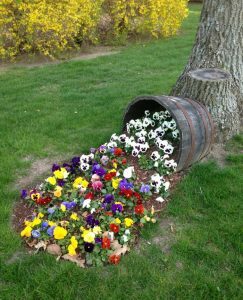 Some novice gardeners may have the misconception that when the snow melts away and the temperature warms up that flowers simply do as nature intended and sprout from the ground. The truth is that these vibrant blooms require prep work in the dormant winter season even before spring finally rolls around. While any major spring landscaping overhauls may be best left to professionals, there are some steps that homeowners can take in the cold months. Some of this prep may include general property cleanup, pest control, fertilizing, pruning, splitting and planting for a fuller effect. Understanding the growth patterns and unique needs of your spring blooms can help you decide the most effective schedule for planting and watering. While it may take a bit longer to see progress with varieties such as daffodils, hyacinth, forsythia, snowdrops and other late bloomers, you can get an early start with perennials that come into bloom each year as the winter passes. With the unique needs of each flower and plant you’d like to include in your spring landscaping, it is very important to lay the groundwork for success. Enlisting the help of a professional who understands the needs and growth patterns of these plants can ensure you are setting up your landscape for success. Even if you plan to do some of the light maintenance in between visits, the input from an expert gardener or horticulturist can keep you on track and give you peace of mind knowing that your investment is properly cared for.